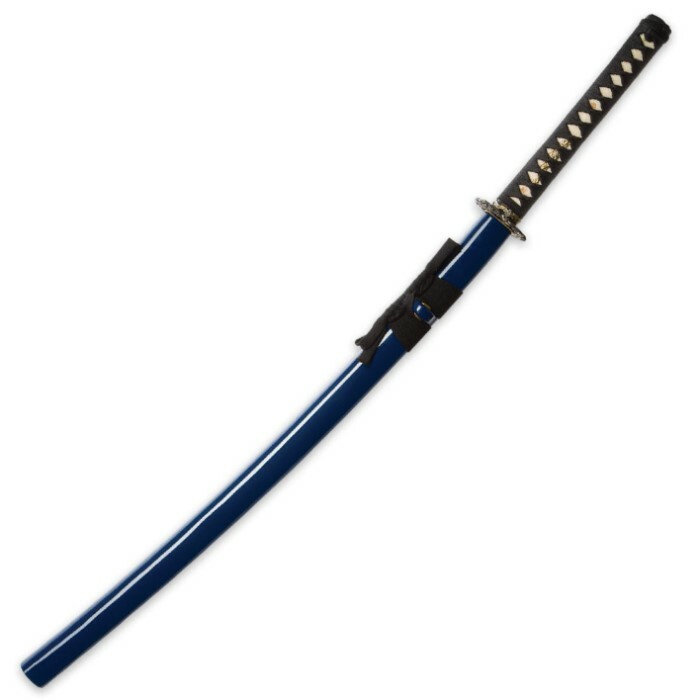 Our Circle of Dragons Traditional Japanese Katana was inspired by the many myths and legends in Japanese lore about dragons. Most Japanese dragons are water deities that are associated with rainfall or bodies of water. The dragon Ryujin was the supreme deity of the sea in Japanese mythology and controlled the tides of the world. The 28 3/4” 1060 high carbon steel blade is sharp and polished, also bearing a traditional heavy blood groove down its center and the hardwood handle is wrapped in genuine ray skin and black cotton cord with an ornamental menuki. 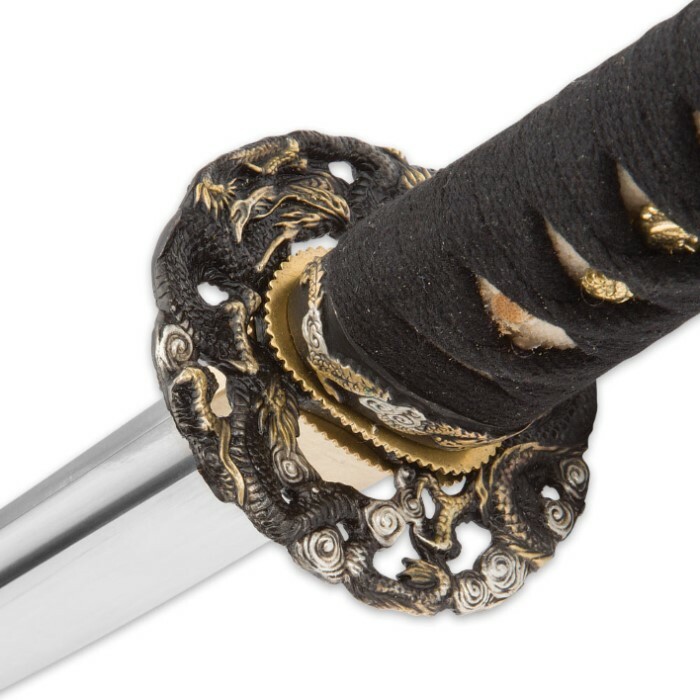 The cast brass gold and black tsuba of this sword was crafted using the powerful iconic dragon as the inspiration and the theme is carried through on the pommel, as well. 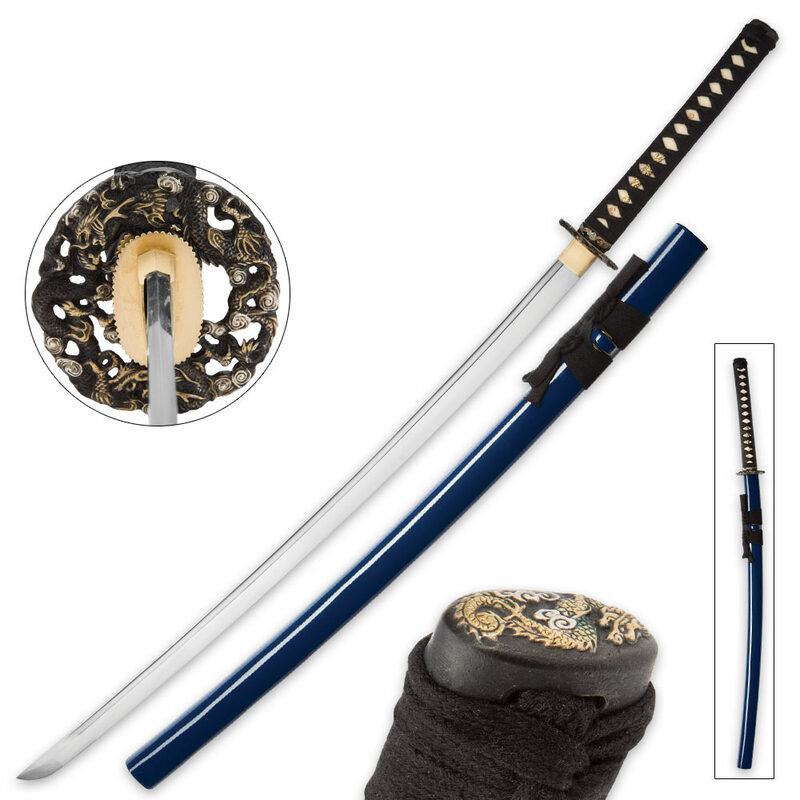 A blue lacquered wooden scabbard sheathes the blade to protect it from the elements. Also included are a sword bag and decorative gift box. Came a little less than full sharp, but still out of the box due to great blade geometry it cut deep into the box it came in. Gave it about 8 strokes with a fine diamond hone and now its really sharp. So sharp that I cut clean through in one swipe a gallon milk jug filled with water. No ragged edges, a clean cut. Great sword well worth the price. The box /case that came with it is also nice. Hurry and get one before they run out. Recieved this sword in my parcel today! Impressive in its feel and form. No fake hamon which is a plus. I really like the ray skin wrap on this one, very aggressive texture more akin to a 100 grit sandpaper. Very nice polishing job on blade. I Recommend totally!